With more than five million active members, Aeroplan is Canada’s most popular travel rewards program. 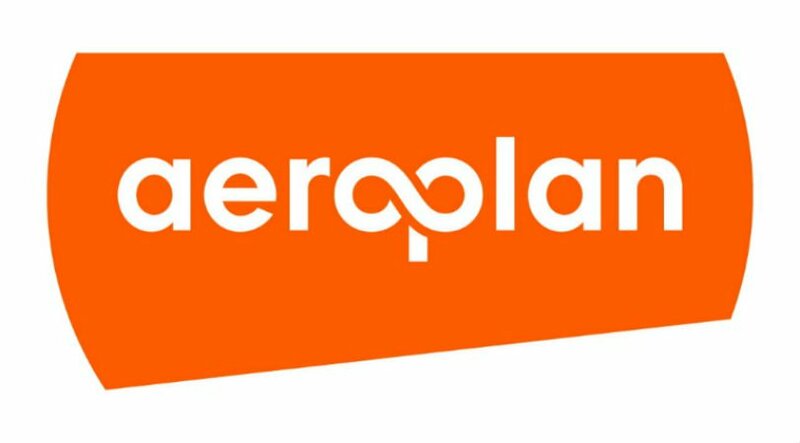 Members earn Aeroplan miles with Aeroplan’s growing network of world-class partners, which represent more than 150 brands in retail, travel, and financial services. To make it easier for members to earn more miles, the program has well-established partnerships with TD, CIBC, and American Express. That gives you have the opportunity to earn miles twice when you use your Aeroplan Visa or Aeroplan American Express card at one of the partner brands. Receive up to 30,000 Bonus Aeroplan Miles – that’s enough Aeroplan points for an economy long-haul flight! One of Canada’s best travel credit cards just got better. The TD Aeroplan Visa Infinite card has updated its promotional offer and you can now earn up to 20,000 Aeroplan Miles. Here’s how: First, you’ll receive a welcome bonus of 15,000 Aeroplan Miles with your first credit card purchase. After that, you’ll receive another 5,000 Aeroplan Miles when you add an authorized user to your account by September 2, 2016. If that’s not enough, you’ll also get the $120 annual fee rebated for the first year, making this an exceptional promotion. As before, this card earns you 1.5 miles for every dollar you spend at gas stations, grocery stores, drugstores, and at aircanada.com, whereas you’ll earn 1 mile for every dollar spent everywhere else. While you’re away on that getaway that you’ve redeemed your miles for, you can rest easy knowing the card’s comprehensive travel insurance has you covered. These include trip interruption/cancellation insurance, common carrier travel accident insurance, and car rental collision/loss damage insurance. The American Express AeroplanPlus Platinum Card is in a category of its own. It’s by far the most rewarding Aeroplan credit card on the market, so naturally, it’s the most expensive. 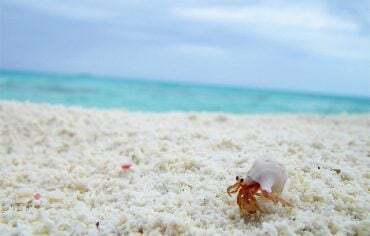 For an annual fee of $499, you’ll earn a massive 50,000 Aeroplan miles after you charge $1,000 to your card within the first three months of receiving it. However, this offer is only valid until September 30, so make sure to take advantage of it before it ends. With this card, you’ll earn 1.25 Aeroplan miles for every dollar you spend, up to $25,000 annually. Every dollar in purchases above $25,000, will earn you 1.5 miles. Another thing that separates this card from other Aeroplan cards is the annual partner ticket that’s included. Once a year, you can redeem 15,000 Aeroplan miles for a short-haul round trip reward seat in economy class, and you’ll receive a second partner ticket for the same trip. Other flight benefits afforded by this card include Air Canada priority check-in, access to more than 700 airport lounges worldwide with the Priority Pass membership, and access to the Pearson priority security lane, which allows you to avoid long lineups during peak hours at Toronto Pearson International Airport. And if that isn’t enough, the AeroplanPlus Platinum Card will allow you to receive platinum status in the Fairmont President’s Club after charging five stays or five nights in the same calendar year at a Fairmont property. Without the card, you’d need to charge 10 stays or 30 nights to receive platinum status. Like the TD Aeroplan credit card mentioned previously, this card also has a broad range of travel coverage, including car rental theft and damage insurance, out-of-province/country emergency medical insurance, and travel accident insurance. 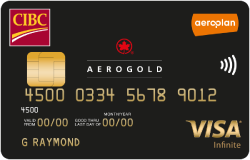 The CIBC Aerogold Visa Infinite and the TD Aeroplan Visa Infinite cards mentioned above are similar in many ways. 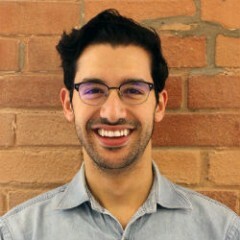 They both have an annual fee of $120 (although CIBC doesn’t waive it in the first year); they both come with a 15,000-mile bonus when you make your first purchase; they both let you earn 1.5 Aeroplan miles for every $1 spent at gas stations, grocery stores, pharmacies, and on aircanada.com; they both earn you 1 Aeroplan mile for every $1 spent on all other purchases; they both have the exact same suite of travel insurance, the only difference being the extent of the coverage. Finally, they both come with exclusive Air Canada travel benefits, which include priority boarding, priority check-in, and a free complimentary first checked bag. The difference between these two cards lies in the trade-off between the short-term and the long-term gains. 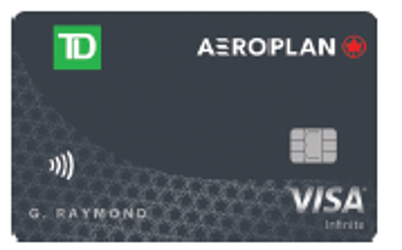 The TD Aeroplan Visa allows you to earn a huge number of miles upfront, but beyond that, you can only earn either 1 or 1.5 Aeroplan Miles per dollar (depending on the spending category). On the other hand, while CIBC’s Aerogold Visa Infinite only gives you 15,000 bonus miles for signing up (as opposed to TD’s 25,000), it allows you to earn up to 3 Aeroplan Miles for every $1 you spend at participating CIBC Bonus Rewards restaurants, hotels, inns and spas. This difference has the potential to make the CIBC card more valuable in the long run, depending on your spending habits and preferences. 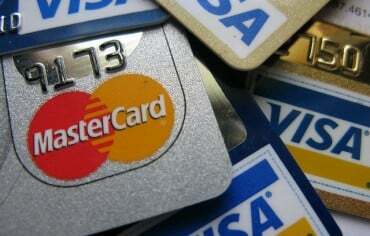 What’s your favourite Aeroplan credit card? Let us know in the comments below!